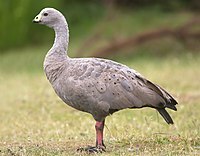 The word "goose" is a direct descendent of Proto-Indo-European root, ghans-. In Germanic languages, the root gave Old English gōs with the plural gēs and gandres (becoming Modern English goose, geese, gander, and gosling, respectively), Frisian goes, gies and guoske, New High German Gans, Gänse, and Ganter, and Old Norse gās. This term also gave Lithuanian: žąsìs, Irish: gé (goose, from Old Irish géiss), Latin: anser, Ancient Greek: χήν (khēn), Dutch: gans, Albanian: gatë (heron), Sanskrit hamsa and hamsi, Finnish: hanhi, Avestan zāō, Polish: gęś, Romanian: gâscă / gânsac, Ukrainian: гуска / гусак (guska / gusak), Russian: гусыня / гусь (gusyna / gus), Czech: husa, and Persian: غاز‎ (ghāz). Because of the age of the laws — it was then believed that geese lived longer than other birds. ^ Lamprecht, Jürg (1987). "Female reproductive strategies in bar-headed geese (Anser indicus): Why are geese monogamous?". Behavioral Ecology and Sociobiology. Springer. 21 (5): 297–305. doi:10.1007/BF00299967. ^ Howard, Hildegarde (1955). "New Records and a New Species of Chendytes, an Extinct Genus of Diving Geese". The Condor. 57 (3): 135–143. doi:10.2307/1364861. JSTOR 1364861. Carboneras, Carles (1992). "Family Anatidae (Ducks, Geese and Swans)". In del Hoyo, Josep; Elliott, Andrew; Sargatal, Jordi. Handbook of Birds of the World. Volume 1: Ostrich to Ducks. Barcelona: Lynx Edicions. pp. 536–629. ISBN 84-87334-10-5.